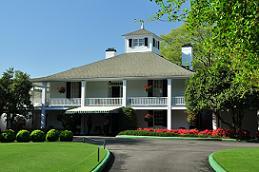 The Augusta National Golf Club was built in Georgia on the site of a former indigo plantation, and it opened its doors in 1933. Since 1934 it has played host to the annual Masters Tournament, and every year when the tournament rolls around, I have to hear annoying twats people whine about how it’s unfair that Augusta doesn’t allow females to join as members. I commend Augusta for sticking to their guns and refusing to bow to feminist complaints. There are plenty of female-only groups like sororities, Girl Scouts, MADD, or psychiatrists’ waiting rooms, and there’s no need for them to invade Augusta, too. I can only imagine how refreshing it is to sit on a couch in the Augusta clubhouse and know some skank in a miniskirt has never rubbed her syphilitic cooch on it. You could actually lie down and take a nap on the furniture without the secret fear that some crotch cricket is going to surreptitiously make its way up your nose. What? I’ve just been informed that not only are women allowed on the grounds, but they can play as guests of members and use all of the facilities. Then what’s the point? If you’re going to allow women to rub their greasy lady-parts all over everything, you might as well just admit them as members. For all these years I thought women were prohibited from actually setting foot on the property, not just joining.